Through the work of three artists: Jill brooks, Mélanie Rocan, and Shelly Vanderbyl; this exhibition examines the role of art as a significant tool in our journey to hope and healing; and contemplation of what is and what might be. Art is not an afterthought at St. Boniface Hospital; it is the raison d’être for the Buhler Gallery in this non-traditional, medically focused space. A recent study, commissioned by London-based arts charity and social enterprise Aesop, found that among 1,002 general practitioners interviewed, two-thirds agreed that “public engagement with the arts can make a significant contribution to the prevention agenda.” Dr. Laura Marshall-Andrews, with the Brighton Health and Wellbeing Centre, when asked about the impetus behind the greater interest for arts in health today, suggested that patients’ needs are not being met and resources are lacking. Everyone is under pressure, noting that patients are living much longer, in more isolated environments, and with less community support. “A lot of social change has been medicalized, and we’re starting to realize that and try and do something about it.” While it takes more than positive attitudes to affect change, the findings are encouraging. Medical care is becoming more holistic in its approach. Increasingly, the goal is to maintain health and stress long term care rather than short term intervention; health maintenance is the goal and the visual arts are part of that movement. In their book Art as Therapy philosopher and author Alain de Botton, and art historian and theorist John Armstrong, argue that art can serve a distinctly practical purpose. Art works, they contend, can be approached as tools for the resolution of difficult issues in individual life. Hope, Healing & Contemplation, through the work of artists Jill brooks, Mélanie Rocan, and Shelly Vanderbyl, looks at the role art plays in meeting the physical, emotional and spiritual needs of the viewer. Brooks, Rocan and Vanderbyl create work that is rich in emotional texture, and meaning; while varying in subject matter, mediums and style. Each artist constructs narratives that invite us to explore moments and viewpoints from both an emotional and analytical perspective. Each work holds within itself an awareness of environment and life experience, and presents the possibility of personal transformation. providing comfort. She sometimes refers to them as “good medicine”. 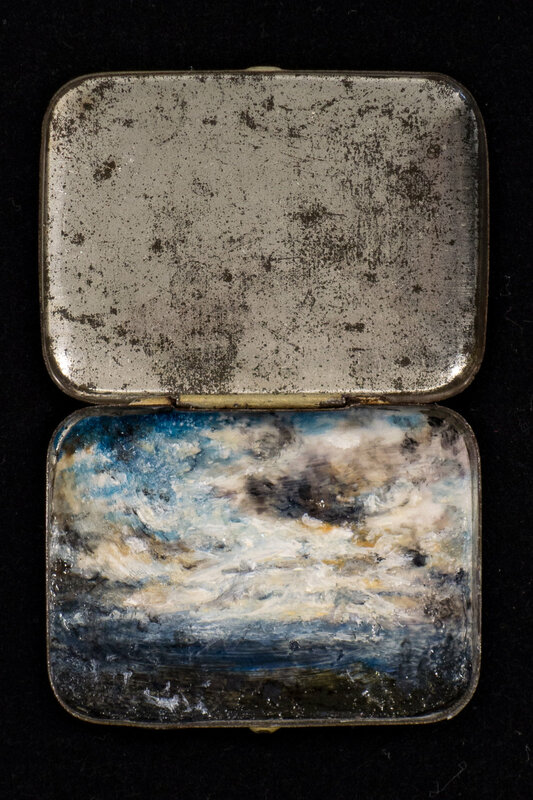 Her tiny landscapes, nestled into empty, old-fashioned metal tins that formerly dispensed relief in pill form, now offer a new and holistic form of relief in moments of distress. 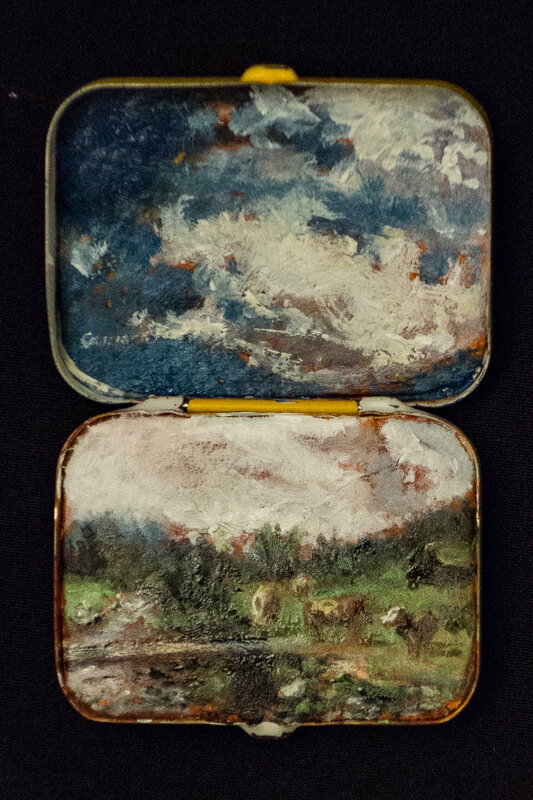 Both Vanderbyl’s miniature landscapes, and her larger frescoes, are informed by her lived experience. As a military wife, she has pulled up roots, moved, and built a new life for herself and her family, in a new location, as career moves demanded. 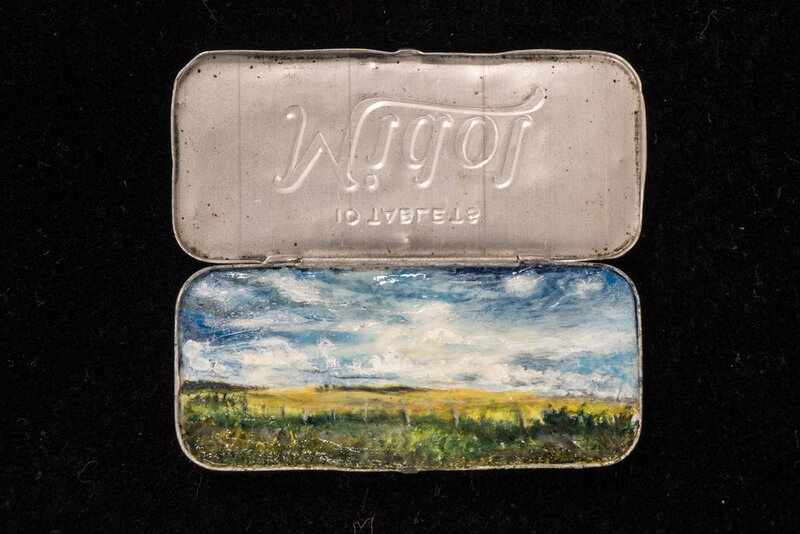 The tiny vintage tins travel safely in her pocket and provide a way to remember and to feel comfort through the pastoral. 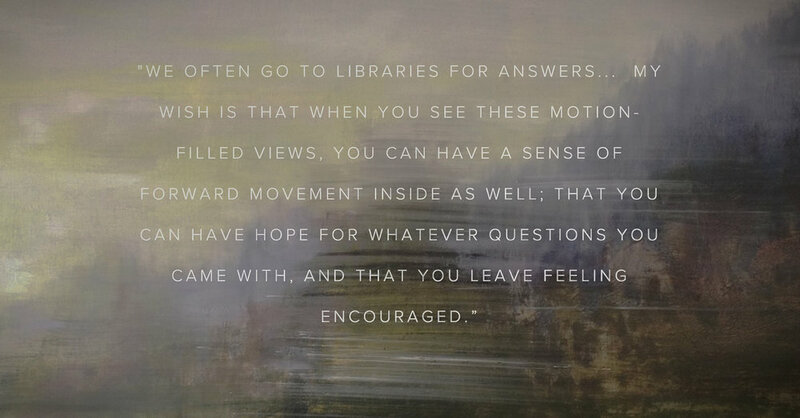 Vanderbyl is particularly interested in reaching people experiencing mental hardships and those with Post Traumatic Stress Disorder, and asks, “If what someone has seen can leave them broken, can an image be a part of their healing?” Her nature-inspired frescoes deal directly with trauma. After years of working as a dry-wall taper and working to create only smooth surfaces, her frescoes explore a very different esthetic. Layer after layer of plaster is applied, each new layer represents a risk that will change the outcome of the work. Her frescoes have a feeling, and a texture, of roughness. “They’ve had trauma too,” she says, referencing the Japanese aesthetic of Wabi Sabi, which celebrates the beauty of imperfect things; chips, marks, and signs of wear only adding to their beauty. With its scars and imperfections, her work reflects deeply personal events in her own life that resonate with the viewer. Reclaimed Ash, a piece she says that she will likely never sell, includes marks made from the charred branches of her beloved apple tree that became diseased and died. She planted it to literally “put down roots” in a new home and keep track of precious stable years in one place. The tree no lnger exists and she has moved homes; but the tree provided her with the opportunity to reclain its ash and become part of the textures of her paintings. Remembering, through works of art, helps us to hold on to the things we love; to bring to mind what really matters: something complex or elusive that can be grasped at its core. This unease is felt in Narrow Path. We are faced with a wall – beautiful, but still a wall – and a tunnel. Where does the tunnel lead? Is the wall meant to keep the viewer out; or to keep the viewer safe? Are the flowers hiding something? Does the tunnel in fact lead to safety? Or not? The beauty in the ambiguity is beguiling; yet tension keeps us suspended. Regrettably, not all paths we choose – medically or in life – are what we hope for. We want to navigate this environment, to move forward, but there is an element of risk and uncertainty in our journey. The female figure in Hybernation is partially hidden or even caught in her environment. She is laying on her side, hands and arms cradling her head, while she lays in a garden of dark foliage. A shear lace veil floats in piles over her – hinting at dreams and awakenings. The dark garden and its inhabitant remind the viewer of Persephone, princess of the underworld, who carries into effect the curses of men upon the souls of the dead. Persephone is the wife of Hades, the god of the underworld, and her abduction represents her function as the personification of vegetation, which shoots forth in spring and withdraws into the earth after harvest. In this painting, the woman’s posture alludes to a sad narrative, even with the first signs of light visible behind her. Sorrow is written into the contract of all of our lives – it is a central and universal feature – but we are not suffering alone. Stars and oceans, glints of light, remind us of how we are part of the immensity of space and time. In our worst experiences, “art is there to lend them a social expression”. While the female figure in Rocan’s work rests in an ambiguous and surreal landscape; Brooks’ women are nestled safely and comfortably in their emvironments. Brooks’ paintings of female figures in gardens re-imagine notable women from decades of popular culture. Each depiction and each character references an archetypal Eve, a metaphor, which Brooks places in her own personal Garden. As in Rocan’s work, even though Brooks’ paintings are filled with colour and light, danger lurks – perhaps unseen – in the form of snakes and poisonous creatures, intimating that innocence can easily be lost. Interestingly, the two artists also share a relationship through their mediums; Rocan began as a watercolourist and now works in oils, while Brooks began with oils and moved to watercolour. These images strike a chord with the viewer. Lush garden images are meticulously rendered. Their carefully immortalized commercial objects – Eves of various descriptions – are lovingly nestled in their midst as a reminder of days past, dreams fulfilled – or not – and wishes for the future. Brooks watercolour paintings are vehicles of light, form and colour, that carry significant content. Flowers have a particular attraction to her as “through their life cycle they assume postures which mirror those of people, expressing the same characteristics of strength and vulnerability.” Her watercolour representations of flowers – roses, asters, tulips – are exquisitely beautiful, inviting the viewer to come near. Upon closer examination, however, they reveal their sad stories. The inherent beauty of the faded flowers encourage remembrance of the past and contemplation of the future. We want to remember what is really important; the essence of a person or a thing. In Nightgarden we see not only the flowers, but also the various creatures that inhabit the garden, frozen in our gaze. The small animals, insects and peripheral flowers form a background for the central image, but are also there to support it and ensure the continuation of the cycle of life, death and rebirth. We are all faced with significant changes in our lives: sometimes the news is good; and sometimes not. We can look at the delicate beauty in a faded flower and remember that sadness is not forever. Sadness and loss, though highly personal, are feelings that are not permanent. Sadness and loss is also not all pervasive; even in the midst of sorrow there are moments of beauty and, eventually, joy. Just like Brooks garden with its tiny creatures; there is beauty, life and resilience in every corner. These three artists invite us to consider their work in the context of hope, healing and contemplation. Each work of art is imbued with a particular feeling: serenity, calm, restlessness, foreboding, yearning, and so forth that the viewer connects with; and can contemplate. Vanderbyl’s tiny landscapes remind us of the natural beauty all around; and her frescoes, with broken and renewed surfaces reassure us. Marks from the past are palimpsests that inform our futures. Rocan’s lush, dreamy and sensuous forms encourage awakenings; as well as moving into landscapes that are unfamiliar and perhaps foreboding. Brooks works evoke the ephemeral and the temporality of our existences; a treasured image of an icon causes us to remember, and a faded flower causes us to contemplate the future. In contemplation we can we can rebalance. Through contemplation these three artists are encouraging us – and all viewers – to become the best versions of ourselves. "Do you think you'll move to a bigger house?" ...This is a question people started asking us not one, but two kids ago. It was so so nice to be able to go on outings as a family. With Danny so busy with school, we normally have to choose to do things without him, or skip it. Unless of course, our adopted neighbours have older kids free to help herd children, and we combine flocks! We planned an activity for Boxing Day, so we'd all have something else to look forward to after Christmas. We were given tickets to a play for children based on Robert Munsch stories, and so we bought a few extras and took another family and Astra's friend. We ended up being seated right next to another family we know, which was so fun! Lily did amazing. She yelled a bit when she got excited and loved the clapping! We even managed some impromptu hosting, and had the family we invited to the play over for dinner after! That felt great. I sure have missed hosting people for dinner on a whim! On that note, Danny has evening classes on Thursdays, so you are officially invited for dinner to keep me company! 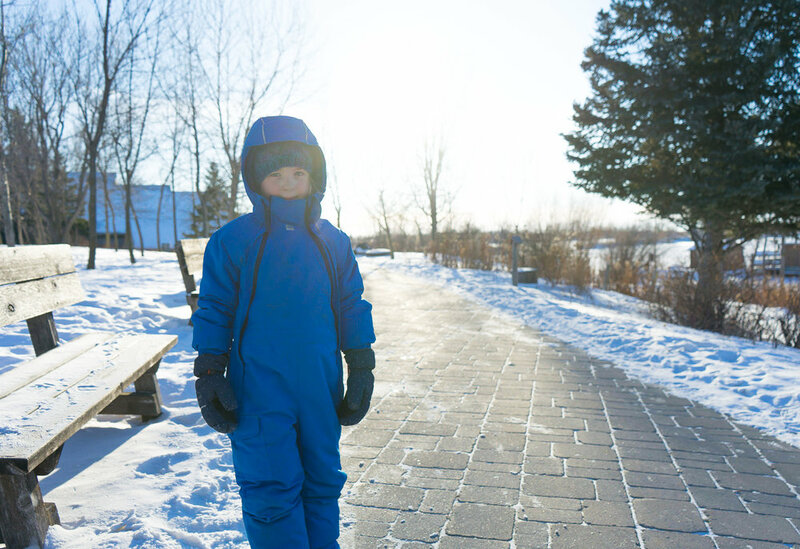 When we'd spent too much time indoors, we headed to Fort Whyte, a local nature center. We ate lunch at the cafe. I love eating there. There are huge beautiful windows with bird feeders outside, a view of the lake, a fireplace. It's set up somewhat cafeteria style, and has the same people working there most of the time, meaning my kids can go and get things and ask for things from the staff themselves, while I hold Lily. The space, with the high ceiling and beams, seems to be sound-absorbing, as I never feel bothered by noise there. My kids feel so comfortable that they spend all their time before the food arrives, visiting the other customers there, frequently meeting other families, elderly couples, or people with disabilities that enjoy the space for the same reasons we do. If it sounds like we go there a lot, we do. Sometimes just for a hot drink or muffin. When I was pregnant with Lily I started going there, instead of to hectic playgrounds and just following my kids along the paths. It seemed like the next best thing to taking a nap. We did a couple of runs down the toboggan slide onto the frozen lake, went to the interpretive centre to look at the aquarium, and burrowing owls, and then headed to the sod house, where they were making snow taffy. The timing for this worked out perfectly. It just re-opened the day before, after extensive renovations. We left after lunch and all three kids had a nap during the 45 min. drive. They were such good listeners and took directions so well in the pool. It was a fun time. One adult was able to be with the older two, and one held Lily with her life jacket. We stayed until supper, had supper on the way back, and the kids fell asleep in the van, so we just put them in bed at home! What a gift that day was. On New Years we headed over to a friend's house with the kids, for a pizza party and countdown to 6:08pm (Does it matter the time?) When the kids were getting tired, we pulled up the youtube countdown, pulled out the maracas and noisemakers, rolled out the bubble wrap for the kids to jump on, and got it poppin'. Lots of New Years hugs, and packed up the kids. Shortly after arriving home, my cousin, a.k.a. The Knotty Swede, and his family arrived from their vacation in Ontario, for a two day visit before driving back to their home. We were so happy to see family. The 6 kids went wild with excitement, but we got them all tucked away in bed eventually. We managed to stay up until midnight, huddled around a few candles, visiting in whispers so as not to wake the child sleeping on the sofa bed close by. It couldn't have been more cosy, or more hygge. So here we are. I think I've recorded this Christmas pretty well. Thanks to my wonderful husband for taking such amazing photos! Danny has come a long way with his photography in a short time and I'm so happy with these images! As a technical person, he has had quite the learning curve getting the hang of composition and more artistic skills, but we are learning from each other. Here I am writing a blog! He took this photo of me showing off my new book, Wabi-Sabi Welcome. Learning to embrace the imperfect and entertain with thoughtfulness and ease. I am already dreaming up some get togethers at the studio and at home in 2018, using ideas in this book. I love things that connect my art and home life, and this book totally does that for me! I wish you all the best this year. Thank you for reading, and stay warm! This year we changed our tradition a bit around Santa. I love the imagination of the story, I think that remembering someone who was generous, and being reminded to be generous is a great thing, but I feel a bit like the story just totally takes over the holiday. Since my husband's father is Dutch, where they celebrate St. Nicholas day by putting out their shoes for St. Nicholas, and my Grandfather and now little cousins are Swiss, where Santa comes and delivers a toy visiting the child's house and greeting them, we thought we'd try a tradition of our own on Dec. 6th. A friend of mine whose family lived in Germany, said as a child they continued their tradition after coming back to Canada, and it made sense for them because they believed that it was sort of like a subscription that you had to sign up for, and that is why their other Canadian friends didn't receive presents on that day. So how did we talk to the kids about it? Well, we've already told the kids from the beginning, "Santa is a game we love to play." I think they might slowly start to wonder if it's only a game while continuing to play it, but the fact is, that people everywhere are playing this game and having a fun time doing it- as simple as that. We talked to the kids about St. Nicholas and who he was and that this is a day for remembering his generosity. So, framed by this Santa is a game we all play, we continued on to say that we were thinking of taking part in St. Nicholas Day, and asking to be on Santa's early list, like our cousins in Switzerland, and other European children are, and what did they think of that, that Mom and Dad were still deciding. They seemed to think it made sense. 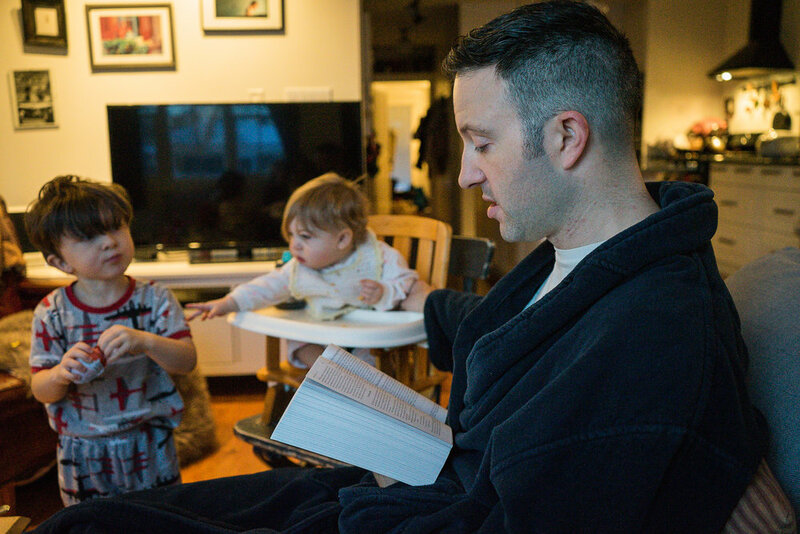 We told them that since Santa knows we are very excited about celebrating Jesus' birthday, that he would want us to focus on Jesus, and that that's more important. The kids fully agreed. When the time came, we set out shoes with the kids, and they decided to put them on their beds. They awoke to toys and candies by their shoes and the Santa cookies eaten up. Yes, they ate candy and headed off to school, and were probably too hyper! What happened after St. Nicholas Day was the best part though. The kids knew that after that, the presents would all be from people they loved. On Astra's last day of school we set out presents in boxes, most of them wrapped, and let the kids wrap presents for each other, or decorate tags for the ones we'd wrapped. The kids weren't in a frenzy about Santa. They seemed calm and secure, and the focus was on us and talking about Jesus. It felt quiet and loving. When we volunteered at our church on Christmas Eve and then stood singing Silent Night, our traditional last song of the night, we were filled with deep calm. We hung the stockings after the kids were in bed, our actual stockings, and cleaned up the house. On Christmas morning the kids were excited to see the stockings and looked for what we put in them, thanking us. It was so nice to receive credit for all our hard work! Our best photo of the three kids together! Christmas Eve Chinese food with our adopted neighbour family. Mom and other daughter had the flu, so they stayed home. Christmas Day! Everybody feeling better! They brought over a delicious Turkey. Astra was so excited to get a harmonica! I had to add these cute photos from Willem's Preschool Winter Party, with a visit from Santa! This year we needed a quiet, restful Christmas. As you can probably tell by my lack of blog posts, life has been busy here. My husband started a Masters program in July. I wish I'd known during those last days of summer vacation, on our road trip to visit family, that when we returned, he would be working so much more than full time, and that I would be suddenly without his help for so many things. I felt like the rug was ripped out from under me, and I'd been trying to catch my balance, but the rug just kept moving. Needless to say, a week of him having to work to do, and spending our days relaxing together as a family has been absolutely amazing! I feel like I finally got my feet under myself, and I'm ready to get back into it again. I thought I'd share a few of the things we did, decisions we made this year, so that we could have a restful Christmas holiday. I made a few decisions that felt selfish, and some that were experiments in simplicity, but I am looking back smiling, and as you'll see in the pictures my family spent a lot of time smiling too. I have wanted to attend this annual event for years. The trouble is that it competes with the annual military children's Christmas party. It's a great event for seeing friends, for checking off a lot of holiday activities from one's bucket list, and for bouncy castles. Who can compete with bouncy castles?! My kids LOVE them. The problem with this children's event though, is that it takes place in a giant gym. The noise, the huge open space, the flurry of activities overloads my brain. I am constantly looking for my children, and by the time we leave I am totally burnt out. My children are cranky and we congratulate ourselves for having survived. I started to wonder, is it worth it? This year, I may have pouted quite a bit, sighed, and acted immature about the whole thing, which I am not proud of, but Danny was able to see past that. He said it wasn't all about what the kids wanted, often they don't even know what they want. "It's your life too. ", he said. We decided to go to the Lower Fort Garry event, and if there was time, make a quick stop at the other party. The kids occasionally asked about the bouncy castles, but it became more clear throughout the day that this was a better fit for us, and everyone was happy that we went. Snowshoeing and warming ourselves by the fire. We made Christmas ornaments as a family, using copies of an old newspaper, dried flowers, wool, paints. I was really excited about the materials laid out on the old table. I absolutely love what we made, and was inspired by the handmade decorations that others had filled the space with. We tried to arrange our crafts carefully in the stoller, to keep them from blowing away in the wind, when we went outside. Warming up with hot chocolate and lunch, while listening to Simpson's Folly playing traditional carols. We spent about an hour there with the kids totally relaxed and content, before deciding to move them along. The view as we were leaving. Glowing sky, rosy cheeks, and soon after... sweet kids, asleep in the back seat. Artist gives 8 ways to design your space for happiness. Gatekeeping is about recognizing what things you don't need or want, and trying to keep those objects from coming into your home. Introducing the Small House Living Series! My favourite "flaw" in the whole house. In my artwork and on my blog, well, with my life in general, I'm aiming to provide people with tools and experiences to improve their mental health. It's something that I'm passionate about, so at Easter it seems right to talk about the best resource I feel like I have for my own mental health. Thank you for making this, of all pictures, your profiles picture. Thank you for speaking less, so that I could speak without speaking over you. How to Clean Up When You're Feeling Overwhelmed. Being Stretched: The Biggest Thing I Ever Made. "Anything I do to this canvas will be better than just burning it..."
The exhibition Övergångar / Transitions brings elements from the Art Festival & Flea Market, that took place in the neighbourhood of Fittja on the 17th September, to Botkyrka konsthall in Tumba. It explores the many facets of place, lost and recycled memories, as well as the new untold stories. In her work, Shelley is interested in caring and nurturing for others. 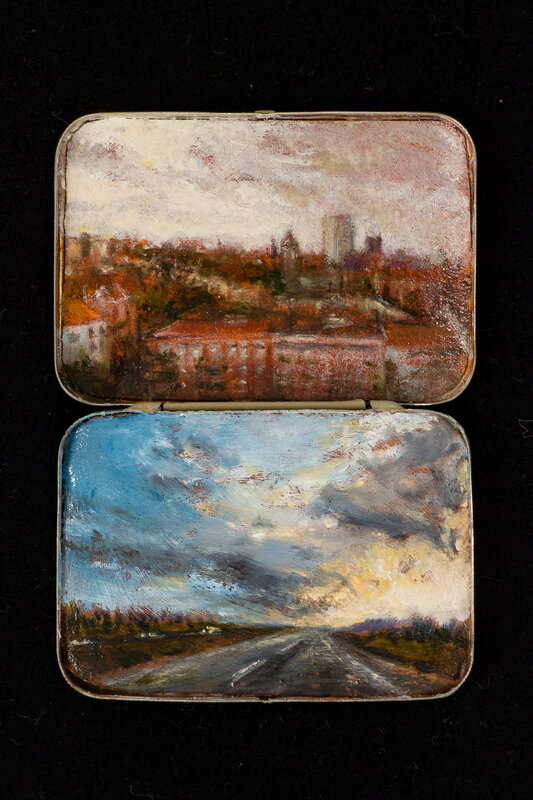 The tiny hand painted landscapes that fit into a pocket, become portals to other parts of the world. They are created as “medicinal” paintings offering relief in times of deep distress. Over the years, the artist has given them away to people who need them, as a pharmacist fills a prescription. The New Biennial for Art & Architecture in Botkyrka is an event that is inviting the community to explore the public space through new forms of art. It is a lo-fi and process based format focusing on the intersection between contemporary art, community engagement and architecture en route to the new arts institution in Fittja. Abir Boukhari (Syria) is invited co-curator for the New Biennial’s Art Festival & Flea Market as well as an upcoming exhibition in Botkyrka konsthall’s current location in Tumba. Abir has been resident curator in Residence Botkyrka during the spring and summer of 2016. She is the co-founder of AllArtNow, a contemporary art centre located in Damascus until 2012 when the war closed it down. It now functions as a nomadic space throughout the world. Most people who see newborns see them sleeping, but there's something awe-inspiring about those times when they open their eyes. Lily, our third beautiful baby. Nussli Salat. My Favourite kind of salad green in Switzerland. There have been many things I've learned about cooking from living in Switzerland. When I was 19 yrs old I worked as an Aupair there, and was so incredibly lucky to have been with a family that not only had amazing taste in cuisine, but that showed me how to make delicious meals, teaching me throughout the year, and preparing meals with me, rather than just tasking me to make them. I've been able to recreate versions of those dishes here in Canada, but some ingredients have been unobtainable. One ingredient was "Nussli Salat"- until now! Part of the struggle was with the translation. I hunted for the lettuce in grocery stores, trying things that might be similar. They weren't. I looked for seeds. I grew what I thought might be it. It wasn't. I grew a different type another year, and wasn't sure if it was. It seemed to stop growing, stunted. I kept the packet. During my time in Switzerland last year making art and attending my exhibition in Gstaad, I decided to try again. I came across some exotic lettuce on a seed website that looked like it might be it. I looked it up on Wikipedia and found other common names for it, and it seemed to describe what I was looking for. One of the names was on the packet I tried. It was so hard to judge the scale of the leaves from a cropped image, and the macro lens photography, when you're used to seeing it on a plate! I found a seed packet at Shelmerdine's Garden Center here in Winnipeg, and finally had great success! This year I realized that it only grows so tall, and then it's done. You can leave it in the ground and it'll get more leaves, but it stays the height of little starter plants. I hope you get to enjoy it someday! I strongly suggest trying it if you are a gardener! If you aren't, I'll try to grow extra, and maybe try to convince a local bistro to grow and serve it!